Join the discussion on our forums! Come discuss Wicked Witchdoctor over in our dedicated Wicked Witchdoctor discussion topic. Whenever you cast a spell, summon a random basic Totem. You can easily defeat her by either dealing 4 damage, or dropping a house on her. Unstable Evolution allows you to spam totems with just 2 cards and a hero power. amazing value! 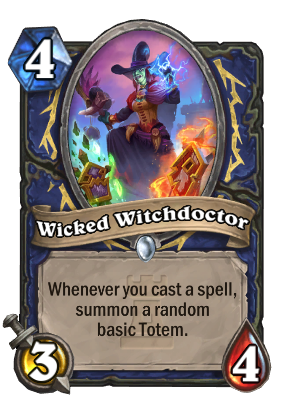 a totem is wayyy better than a 1 1, so this card is actually a much better version of Violet Teacher even though you lose the 1 hp, for no reason I might add. Unfortunately, no one has ever made a shaman deck with violet teacher in it because that card needs a class with good card draw to work like rogue and druid. Shaman has very mediocre card draw. I really like the flavor of this card, especially since totem shaman is in my top 3 favorite decks. It's cool that it kind of provides a different approach to that obscure deck whereas you can build a more spell heavy variant instead of a minion heavy one which you would've done before. More cards should be like this: fun effect that creates new strats, but isn't tournament worthy. When this card was initially released on August 5, people down voted my comment that this is a crappy card. (post #3) "crappy card. a basic totem is worth 1.5 mana at most. If this is a 'random' totem, it'll be much better." and they up voted the guy who was arguing with me and saying this card is great. I even pointed out that all the Pros on stream share the same point of view as me when they streamed their card reviews the following day. Even then, they argued that it's just some Pros and not all. I wouldn't have mind getting down voted if there were valid points but their arguments were just bad. Look at the card today. No one plays it on ladder, I have not seen it once on my climb to legend or at legend rank. It just shows how stubborn some people are and how they do not know how to evaluate cards. He got top 10 because he's a very good player, not because of the card. There was also a surprise element to it where people didn't know how to play around before it's too late. For a deck or card to be good, it should out perform even if your opponent knows every card in your deck. Another example of player skill and not the card/deck is Tyler. He sub in Shifter Zerus in his zoo deck and still climbed to top 20 legend to prove to his viewers that the player skill is more important than cards. Is this card defining the meta or played in shaman in a competitive level? Heck no. I will gladly play against you using this card in your deck. You can add me on battlenet (dannywu#1188) to test run how it's matched up against good decks/ players or queue up against me on Legend ladder. One of the more underrated cards along with Moroes. As i fought. The card is bad in shaman. Tried it for 2 last days in various decks and its either too slow or in control match ups you end up with nice board (evolve) getting wrecekd by aoe and you with empty hand beacuse you had to use all the spells to make it work + the fact that its rather a combo minion requiring a lot of card draw. With evolve - didnt work because evolve is a trash card and you get doomsayer or pyromancer pretty often. With totemcarver or valiant - tooooo sloooooooooooooooow. I even tried thaurisan but then its pretty much a control deck and there are better card to put into a control deck. If you are climbing with a deck containing this card give a shout. made a simple totem deck; this card is currently a rock star in it. basic totems aren't much but when you're running totemcarver, valiant and maelstrom portal hoping for more spell damage she really comes in handy. i wish she was a 3/5 a la teacher but what're ya gonna do. No "I'm melting!" for the death sound? I'm disappointed, Blizzard. Its a worse violet teacher but has potentially impactful totem synergy. The benefit compared to violet teacher is that roling spell power upgrades your spells. 25% to roll air totem which is pretty low. Would you risk lightning bolting a 4 health minion hoping to get air totem? prob not. If you are considering the extra damage to opponent's face, then this card is too slow to play in an aggro deck. Do we know if it summons duplicates? Can someone confirm this summons totems from Totemic Call only? Yeah I don't get what they mean by "basic totem". Somehow I think it refers not to the set, but the hero power totems. Honestly the card seems too slow for Shaman. Their current meta is a mix of aggro/ zoo-ish, and grinder decks that use Ancestral Spirit. Perhaps this card will appear in those fringe totem decks. You have been around since LoE, I presume?